In the evening, Mar. 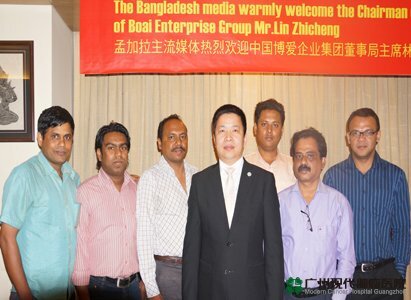 6, 2013, the popular media of Dhaka, Bangladesh gathered in Bamboo Shot to express their welcome to Mr. Lin Zhincheng, the Chairman of Boai Medical Investment Group. Boai Medical Investment Group is the biggest medical investment group in China and a top 100 global medical group as well, who has more than hundreds of large medical institutions, such as Modern Cancer Hospital Guangzhou, Shenzhen Humanity Hospital, Shanghai Yodak Cardio-Thoracic Hospital, Changsha Sunshine Hospital and so on. Those hospitals possess both experienced doctors and leading medical technologies and devices. Among them Modern Cancer Hospital Guangzhou specially enjoys the great reputation both at home and aboard for its technology in treating cancer: minimally invasive target therapy integrated with traditional Chinese and western medicine. As early as 2012, the medical specialists from Gonoshasthaya Kendra University, journalists of Prothom Alo, NTV and Banglanews24 and so on had come to visit the headquarter of Boai Medical Investment Group China and its subsidiary hospital, Modern Cancer Hospital Guangzhou, and had closely learned the real condition and development of Boai Medical Investment Group. For this visit to Bangladesh, Mr. Lin Zhicheng, the Chairman of Boai Medical Investment Group replied to local media elaborately about the questions they cared the most on group development, like medical technology, treatment effect, etc, while Mr. Lin also revealed the development trend and investment strategy plan of Boai and Modern Cancer Hospital Guangzhou in 2013, which attracted the attention of media. Prothom Alo：The economy of Bangladesh develops slowly, why you choose to set up branch office in Bangladesh? Chairman Lin: The service aim of Boai Medical Investment Group is Borderless Medicine & Boundless Love. Patients, for whom Modern Cancer Hospital Guangzhou can serve, are all around the world, and different patients will have different experiences and conditions. We will offer them our excellent medical services whatever their conditions are. Moreover, Boai has set up “Boai Foundation” from which many patients can get help each year. Prothom Alo：Why patients would choose Modern Cancer Hospital Guangzhou rather than the hospitals in India, Singapore or other countries? Chairman Lin: First, Modern Cancer Hospital Guangzhou has its unique anticancer technology: minimally invasive target therapy integrated with traditional Chinese and western medicine. This technology combines advanced minimally invasive technology and traditional Chinese medicine of thousand-year history to start a new model to fight cancer. Featuring small trauma, little side effects and fast recovery, it is popular among cancer patients. Besides, our medical expenses are 1/3 off the prices in hospitals of Singapore. In addition, Modern Cancer Hospital Guangzhou also provides patients over 10 special increment services, including regular movie watching, shopping and sightseeing tours etc, by which win the approval and praise from patients both at home and abroad. Prothom Alo: What achievement has Modern Cancer Hospital Guangzhou achieved on cancer treatments in past few years? Chairman Lin: Through the development in past few years, Modern Cancer Hospital Guangzhou has formed a comprehensive tumor treatment system integrated with traditional Chinese medicine and western medicine which may combine radiotherapy, chemotherapy, thermotherapy, biotherapy, interventional therapy, minimally invasive therapy, gene engineering, and stem cell treatment and so on. Currently, the hospital is ahead in tumor treatment technology in Asia or even the world. The dominance of Modern Cancer Hospital at home and aboard gets greater as overseas offices are established. The patients, who have taken treatments in Modern Cancer Hospital Guangzhou and recovered, have praised hospital greatly, and most of them are from Indonesia, Vietnam, the Philippines, Cambodia, Bangladesh and other countries. Prothom Alo：What are those successful cases in Modern Cancer Hospital Guangzhou? Chairman Lin: our treatment effect is praised by patients, and the successful cases are countless. For instance, there was a patientwhose husband is a highly placed administration leader in a Southeast Asian country. She was informed that her time will be only 7 days more when having treatment in Singapore. She turned to Modern Cancer Hospital Guangzhou later. However, through the consultation of cancer specialist team and after the most advanced minimally invasive target treatment which integrated with traditional Chinese medicine and western medicine, her life span was extended to 4 years.Apart from that, a 4 year-old Vietnamese patient named Nguyen Van Da, who had developed rhabdomyosarcoma which made his lovely face out of shape severely. He came to Modern Cancer Hospital Guangzhou as local treatment could not help him effectively. Through green chemotherapy and interventional therapy, his tumor shrank obviously and general condition was under control. This little boy, who was announced “death”, now can have a normal and happy childhood with family. Prothom Alo：What treatment technologies does Modern Cancer Hospital Guangzhou have? Chairman Lin: Modern Cancer Hospital Guangzhou has 12 international leading cancer treatment technologies which mainly include radioactive particle implantation, minimally invasive therapy, cryotherapy, natural therapy and so on. According to different individual conditions and cancer types, cancer specialists will use one or combine several treatments for a patient. Besides, matching with traditional Chinese medicine for regulation can reduce the side effects from western medicine. In this way not only can extend the life but also improve the life quality of patient. NTV: Thanks Boai Medical Group and Modern Cancer Hospital Guangzhou very much, for your hospitality to the press corps of Bangladesh in 2012. I am one of the press corps of NTV and deeply convinced by the comprehensive strength of Boai and the hospital. I would like to know if Boai Medical Investment Group will set up a hospital in Dhaka. And when would that be? Chairman Lin: With everyone’s support and help, Boai Medical Investment Group has walked over all those 20 years. Here I would like to express thanks to media for all your attention and support to Modern Cancer Hospital Guangzhou. Based on the deep friendship between China and Bangladesh, the medical cooperation between two countries becomes further. We are willing to establish medical institutions in Bangladesh so as to offer more patients the comprehensive medical services. Of course we hope that the plan can be carried out as soon as possible. NTV: As we know more and more Bengali patients prefer to go to China or have treatment in Modern Cancer Hospital Guangzhou, would there be better improvement on your services? Chairman Lin: The concept of Boai is to offer patients and people in need high-quality medical service. Here thanks again for the approval and support from patients. As more and more patients choose China, choose Modern Cancer Hospital Guangzhou for treatment, this is our motion to keep progressing. Modern Cancer Hospital Guangzhou will constantly improve medical services and levels. Meanwhile we hope that patients and friends can offer us more precious opinions about us. And it is confirmed that we will persist in offering the most satisfied medical services to human, so more overseas patients can enjoy the better medical services in Modern Cancer Hospital Guangzhou. NTV: Can you offer more information about enhancing medical exchange and cooperation between Boai and Bengali medical institutions in future? Chairman Lin: We will constantly carry out mutual exchange and cooperation with the hospitals in Bangladesh in future. For example, deliver some new devices and arrange excellent tumor specialist for medical lectures and live complicated operation demonstration in Bangladesh. The medical specialists are also welcomed to visit and inspect the hospitals of Boai. Medicine has no boundaries and all the advanced medical services should be shared to the world. As the chairman of Boai Medical Investment Group, I shall contribute my best to promote anticancer career in Southeast Asia or even in the world.